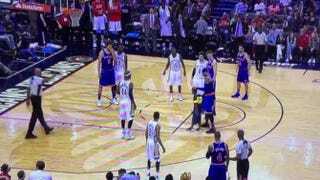 In an NBA basketball game between the New Orleans Pelicans and the New York Knicks in New Orleans on March 28, 2016, a boy ran onto the court and hugged the Knicks’ Carmelo Anthony. Remember the cute little kid who ran onto the basketball court to hug Carmelo Anthony during his game against the New Orleans Pelicans? Cute, right? Well, unfortunately, the incident has cost two people their jobs, according to the Times-Picayune. An usher lost her job and a New Orleans police officer will no longer be able to do security work with the Smoothie King Center because they weren't manning their areas properly, according to the news site. Alan Freeman, Superdome/Smoothie King Center general manager, issued a statement about the incident. ''There is a police officer stationed in that general area also, and he was not doing his job,'' Freeman said. ''So essentially what happened there is that you get two people who were not doing their responsibilities and that led to a black eye for us as the building operator. ''So what we have done since then is, first of all, we obviously replaced those two people who failed to do their jobs—the usher and the police officer," he continued. In addition to the firings, usher staff and police officers had to go through additional training in order to prevent similar incidents from happening.